Easter is a popular holiday in several countries across the world, and Jamaica is no exception. During this time, our American counterparts get busy painting Easter eggs, having egg hunts and adorning their spaces with images of the Easter Bunny. And as time progressed, I have watched many of these American traditions slowly being affixed in Jamaica. For example, easter egg hunts. Don’t get me wrong now. Nothing is wrong with us adopting parts of cultures from other countries. This is a globalized world after all. However, I believe that the preservation of cultural traditions is essential in order to retain one’s unique identity. Anyways, back to your question... What do Jamaicans do for Easter? For us Jamaicans, Easter is like Christmas in March (or April). Well, just like Christmas, Easter is synonymous with food, family, friends and religion. While a few traditions are not as popular amongst the younger generation, there have been several traditions that have remained relevant. I’ll now highlight six (6) of the popular Easter traditions in Jamaica with you. 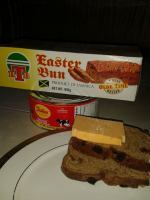 Right at the top where it belongs... when you make mention of a tradition that has been passed down from generation to generation, the Jamaica bun and cheese Easter tradition is the first thing that comes to my mind. Like many other aspects of our culture, the bun and cheese tradition has been derived from our colonial masters, the British. 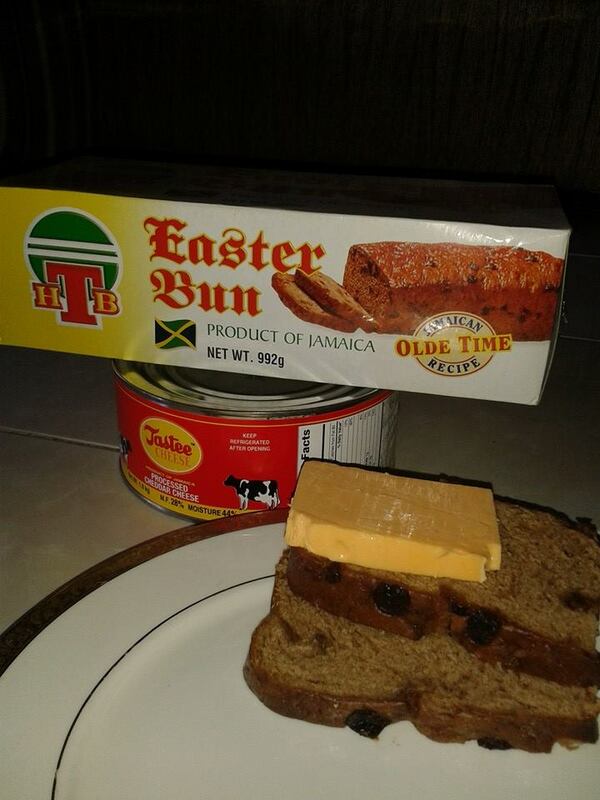 In actuality, the Jamaican bun is a descendant form of the Britain’s hot cross bun. These hot cross buns had a biblical implication as they were marked with a cross which symbolizes the crucifixion and were usually eaten on Good Friday. After colonization the tradition became affixed in the island. The buns have somewhat evolved though. The shape has changed from round to rectangular loaves, and molasses are used instead of honey. Buns are now purchased as opposed to being baked at home as well. As a result, our supermarkets are usually jam-packed with Easter buns in various sizes and in all brands. Combined with cheese, this delicacy is an Easter staple. 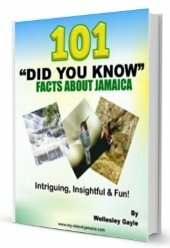 Since the crucifixion and resurrection of Christ forms the foundation of Easter, being a religious society, Jamaica incorporates various religious activities for this holiday. The Thursday leading up to Easter (Sunday) is known as Holy Thursday, while the Friday leading up to Easter (Sunday) is called Good Friday. Some churches hold church service, primarily night services, on both days. However, the main event is on Easter Sunday. Regular church goers, and even party goers alike, take time to out to visit their local churches on Easter Sunday for worship. Bun and cheese isn’t the only Easter delicacy. During the Easter season individuals usually substitute meat for fish in their meals. This meatless diet usually starts during lent and continues during Easter. Fish is however prepared according to one's personal preference. Fried fish, escoveitched fish, steamed fish… it’s all up to you. You may read more about our favourite fish recipes here. Partying and Get-togethers – The Easter holiday begins on Good Friday and continues up to Easter Monday. With such a long break from work and school it’s a great time to catch up with family and old friends. Family and friends usually gather to play games such as ludo, dominos and cards; eat meals and dance along to reggae music pumping from the speakers. Beach Trips are also a common activity during the Easter season. Individuals also arrange for visits to local attractions and other historical sites. For all the party animals, easter in Jamaica comes with a host of revelries for you to attend. While some choose to spend their Easter in church, others choose to gallivant and dance along the streets while being scantily dressed in colorful costumes. Jamaican Carnival began in the 1990s and has become an important part of the easter celebrations, especially amongst the younger generation. This grand celebration usually include road marches, fetes, beach jouverts and performances by soca artists from all over the Caribbean and other energy packed events that gets patrons fired up. However, the most fascinating thing about carnival is definitely the costumes which are always brightly coloured and accentuated with feathers and gems. Since carnival also includes music there are always bands. Some popular carnival bands are : Xaymaca International, Xodus Carnival, Bacchanal Jamaica and Jamaica Carnival. This is an old tradition that’s is common amongst older folks. Basically, an egg white is dropped into a glass of water before Good Friday morning. It is believed that when the sun rises, the shape of the egg white predicts the future of the person who sets the egg. For instance, if the egg white takes the shape of a ship, it predicts that the person will be travelling overseas in the coming years. And then there is the plane and the casket, so go figure! But what about you? How do you spend your time during Easter? Please share it with me in the comments below. And before you go... how about a Jamaican easter bun recipe? Here's a great and simple one.